The religious and political changes of the years 1531 – 1536 were profound. During that period, a thousand years of dominance of the English church by Rome were thrown off as the King was proclaimed as Supreme Head of the Church of England. That was not the only upheaval - the succession to the Crown was changed, firstly to favour a younger sister over her elder sister, and then to permit the King to appoint a successor by Will – an extraordinary alteration to the usual rules of inheritance. Whilst these changes may not have a great deal of effect on the day-to-day life of people, the other religious changes, in particular the Dissolution of the Monasteries, and the Act of Ten Articles which stated that Masses for the souls of the dead were of no effect, were revolutionary. 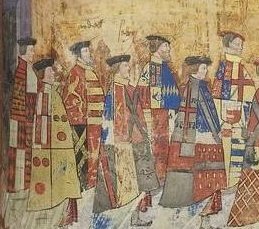 The majority of people of influence in Henry VIII's government and court – his nobles, churchmen, councillors and wider family – accepted the changes. Although it was apparent that not all of them agreed in their hearts, there were few who were willing to undergo the deaths that Sir Thomas More and Bishop Fisher of Rochester suffered, for rejecting the Royal Supremacy. Among those who accepted Henry's changes, at face value at least, were his cousin, Henry Courtenay, Marquis of Exeter, and his second cousin, Henry Pole, 1 st Baron Montague. Their womenfolk, however, were not so compliant. Exeter's wife, Gertrude Blount, was an outspoken supporter of Katharine of Aragon, Henry's cast-off first wife and Montague's mother, Margaret, Countess of Salisbury had been a close friend of Katharine, as well as Lady Governess to Henry's daughter, Mary. Lady Exeter and Lady Salisbury had been, to say the least, unaccommodating to Henry's wishes and Lady Exeter had been involved in the treason trials related to Elizabeth Barton.